It’s no secret that efficiency is a paramount of today’s business climate. Implementation and utilization of technology has furthered this notion, including organizations taking full advantage of form templates in daily use of its operations. A clear example of proof is the free, downloadable company letterhead available here! It’s free, easy to use and customizable to fit any user’s needs! Where company’s were once forced to hire an outside design firm to successfully obtain a standout, unique company letterhead (and logo), increases in available options have changed the way a company may go about this small, yet important acquisition. 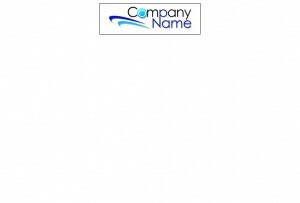 Simply “right-click” and save the company letterhead template given here. Fill out your organization’s pertinent information (such as address, contact information). This may be placed along the bottom or top depending on your desired choice. Save the changes and that’s it! So, before considering overpaying for an elegant, effective company letterhead for your organization’s future use – rethink your approach: save time, effort, financial resources and headache’s by using this free, customizable template. A few simple clicks allow alteration at any time and ensure your organization has a professional look and presence felt when using written communication!